The Community Alliance 4 youth Success collaborates with other youth-serving organizations to build developmental assets, reduce harmful substance use and other risk-taking behaviors, and improve the health and education outcomes of Midland County Youth. Today’s youth face challenges that were unforeseen a few decades ago. 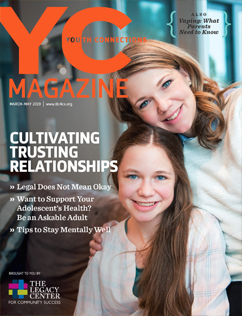 Youth Connections magazine provides information that helps parents guide their children through the transitional stage of adolescence. E-cigarette use among teens tripled in 2014, from 4.5% to 13.4%, and odds are that your teen will be pressured to try them. Studies show that e-cigarettes, or vapes, also may be serving as an entry point to tobacco use for kids who otherwise wouldn't smoke. The ability to do tricks, as well as tempting flavors like grape and bubblegum, are driving their popularity.